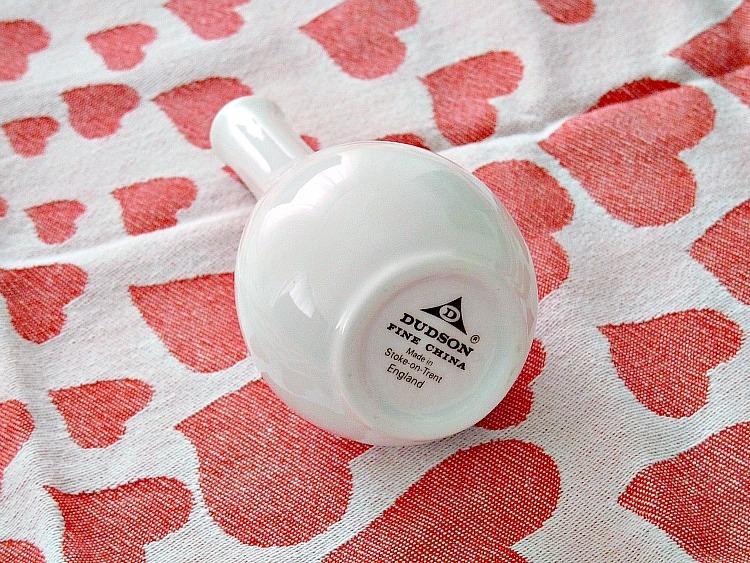 I was on the hunt for a teeny tiny vase and recently thrifted one (that’s made in England)! Hubby hates thrift stores but he was with me when I found it, reinforcing my belief that he is my lucky charm and must accompany me on all thrifting adventures. Hear that? That’s Hubby sobbing quietly in the background. The vase was a little bit dirty inside and when I brought it home I realized my bottle brush didn’t fit. I really need a set of these Lee Valley brushes. I tried soaking the vase in soapy water but no dice. No worries, I had a plan. I poured in a few drops of undiluted dish soap and let it sit overnight. 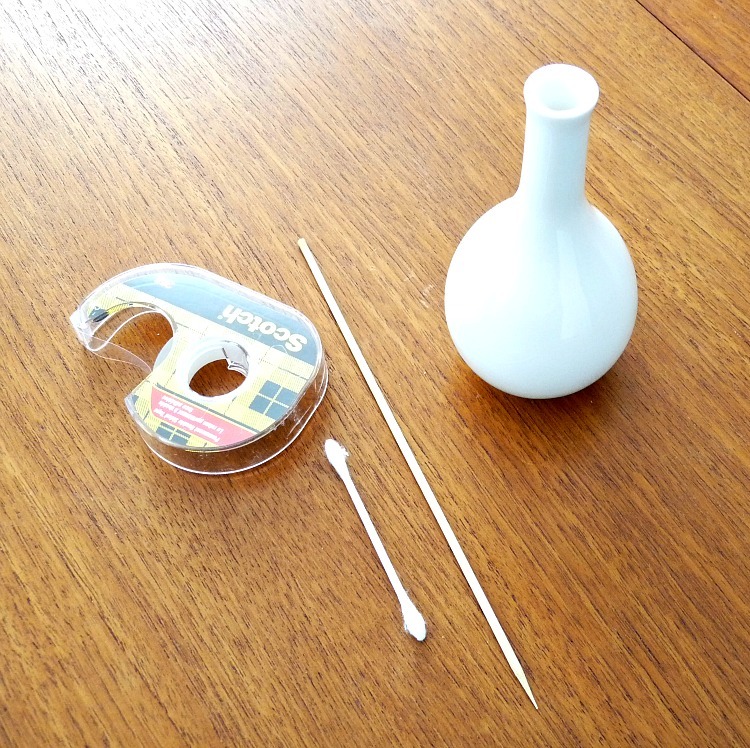 Then I taped a Q-tip to a wood skewer and scrubbed gently. 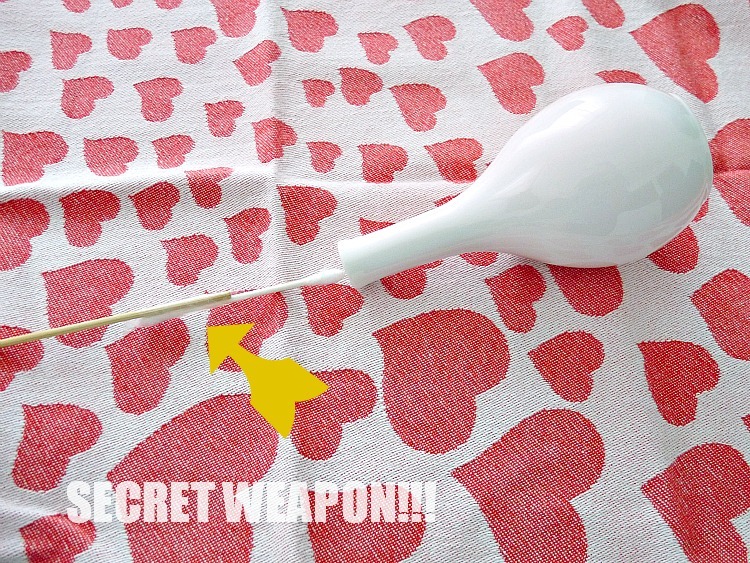 (You can also buy extra long cotton swabs). All the gunk and dirt came off with just a little coaxing. I rinsed out the vase and, voila, a new home for my . . . drumroll please . . . first ever real billy button. You know how much I loved my felted wool version, but now I have the real deal. In Budapest we got into the habit of buying fresh flowers from older women selling them at subway stations. This was the only billy button of all the bunches, so I saved it and smuggled it home. Most tricks I read about depend on either using some kind of acidic solution or something abrasive, sometimes a combination of both. 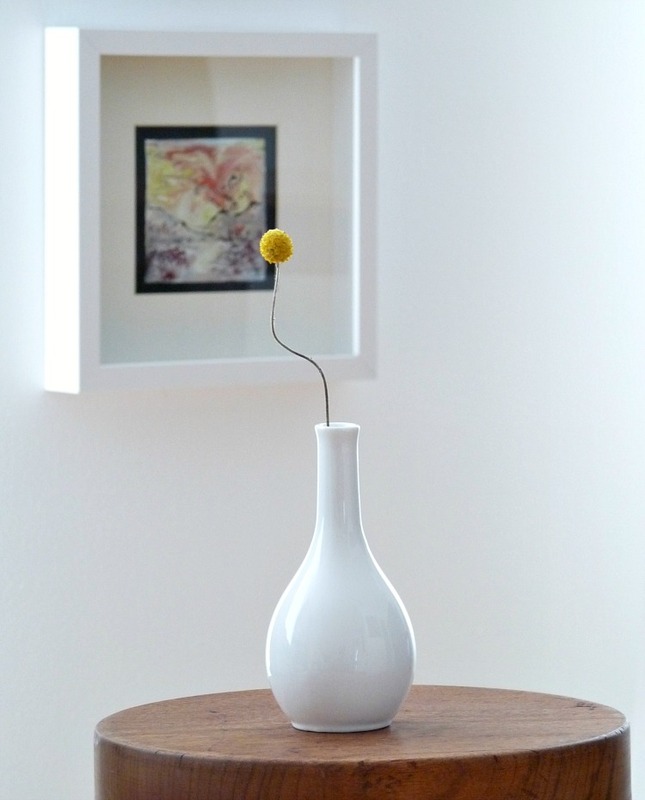 Here’s a tip to keep a vase from building sediment: pour in some vegetable oil, swish it around and then pour it out. That residue, I’m told, will keep your next bunch of flowers from staining the vase. Do you do any of these tricks or have one of your own? Previous Post Our Weekend Project: It’s Cool . . .
uGH… I hate cleaning vases. Do all these work for that white residue that stays on vases? Supposedly!! I did a weirdly large amount of research and that residue is what most tips are trying to remedy. However, I think the residue really does need some type of solution, like vinegar or toilet cleaner and not just the swishing action of rice. Good luck cleaning and if you find any of these are awesome/not awesome, let me know! I cherry picked ideas with the most positive feedback from friends, family and the worldwide web! 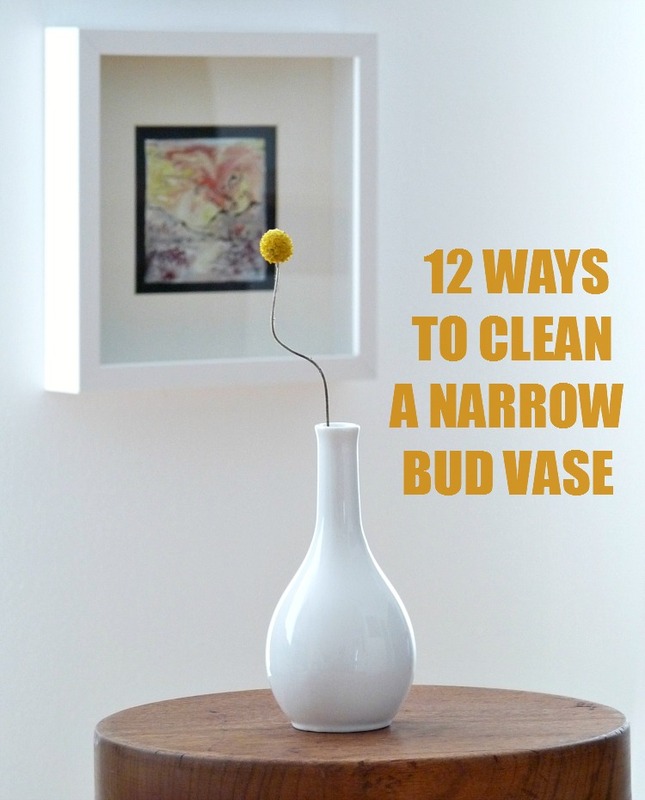 Ammonia and BBs work well too, and if it's a clear glass vase, a final rinse with rubbing alcohol makes for a quick, streak-free dry. Hi Tanya,I wanted to let you know I came across your blog from Canadian House & Home (I think…) and I have now read it from Blog 1! I really enjoy your blog and now have come to a sad 'end' of catching up so now I have to await a new blog post when I want to read! You are such an inspiration! I hope to get more DIY-ey myself.. and your personality seems so much like mine! I look forward to your new posts! P.S. I am in Southern MB 🙂 So lucky I can get things shipped to the States and I just take the 40 minute drive and pick 'em right up! Mwahah! The border guys know me, we are even FB friends! Have a great long weekend and expect to see more of my comments!Sincerely,A "Dans le Townhouse" super-fan! P.P.S. I love it 'french' it up by throwing in french terms to people sometimes. And I am super excited.. I might pay the $15 to get a french Manitoba license plate 🙂 What's your pinterest link? I'd like to follow you.And now i seem like a creeper! Hi Tanya,It was great to see you grow as a blogger and photographer! I was very pleased reading all the posts!Oh New York is MUCH fancier than North Dakota! !I can't wait for the new posts! I don't know, some of the little towns in NY state are pretty . . . casual. It's so nice to hear that you've seen growth in the blog. It certainly became addictive and now I'm constantly trying to make it better. The photography is a real challenge – we have such limited light some days, esp. with winter and a lack of windows. I photographed a big space with huge windows one vacation and it was such a joy! The little town I go to is Walhalla.. SO small!! Did you take a course at all?? I have SLOWLY started a, personal, blog.. it's a tad confusing even though I'm quite 'computer savvy'.. It'll get there! The main reason I started was hubby and I want to build a house within a few years so I want to blog about that! Working where I do, a kitchen & bath cabinet company – designing kitchens and such, it's REALLY gotten me to look closer at details in magazines and look on Houzz to find my 'style'. Poor hubby, has to endure me talking about 'sweet toilets', 'super-cute light fixtures', (< I care about the oxford comma) and 'cool windows'… By the way, it was a LONG time ago, I HAVE been to Thunder Bay! Have you ever been to Orillia? No courses, but I do a lot of googling when I run into problems/want to add something. I have been adding bits of code here and there and it was going swimmingly, but now I'm running into problems. I think I've made the behind the scenes part messy. But the outside is 100% prettier – I wish I had screen shots of version one. It was blah. I'm happy to share (what limited) things I have learned. Email me anytime: dans.le.townhouse@gmail.com.Yay for visiting Thunder Bay!! Did you see the giant? I have never been to Orillia (except to pass through it). Thanks Tanya! I may have to take you up on that offer.. Thunder Bay was SO long ago.. I don't even remember it! I have been looking for testube (vase) brushes forever, and had pretty much give up on finding them. That link was exactly what I needed. Thanks a bunch.